Because of the city's location in the Whitehorse valley, the climate is milder than comparable northern communities such as Yellowknife. At this latitude winter days are short and summer days have up to about 19 hours of daylight. Whitehorse, as reported by Guinness World Records, is the city with the least air pollution in the world. As of the 2016 census, the population was 25,085. Archeological research south of the downtown area, at a location known as Canyon City, has revealed evidence of use by First Nations for several thousand years. The surrounding area had seasonal fish camps and Frederick Schwatka, in 1883, observed the presence of a portage trail used to bypass Miles Canyon. Before the Gold Rush, several different tribes passed through the area seasonally and their territories overlapped. The discovery of gold in the Klondike in August, 1896, by Skookum Jim, Tagish Charlie and George Washington Carmack set off a major change in the historical patterns of the region. Early prospectors used the Chilkoot Pass, but by July 1897, crowds of neophyte stampeders had arrived via steamship and were camping at "White Horse". By June 1898, there was a bottleneck of stampeders at Canyon City, many boats had been lost to the rapids as well as five people. Samuel Steele of the North-West Mounted Police said: "why more casualties have not occurred is a mystery to me." On their way to find gold, stampeders also found copper in the "copper belt" in the hills west of Whitehorse. The first copper claims were staked by Jack McIntyre on July 6, 1898, and Sam McGee on July 16, 1899. Two tram lines were built, one 8 km (5 mi) stretch on the east bank of the Yukon River from Canyon City to the rapids, just across from the present day downtown, the other was built on the west bank of the river. A small settlement was developing at Canyon City but the completion of the White Pass railway to Whitehorse in 1900 put a halt to it. The White Pass and Yukon Route narrow-gauge railway linking Skagway to Whitehorse had begun construction in May 1898, by May 1899 construction had arrived at the south end of Bennett lake. Construction began again at the north end of Bennett lake to Whitehorse. It was only in June–July 1900 that construction finished the difficult Bennett lake section itself, completing the entire route. By 1901, the Whitehorse Star was already reporting on daily freight volumes. That summer there were four trains per day. Even though traders and prospectors were all calling the city Whitehorse (White Horse), there was an attempt by the railway people to change the name to Closeleigh (British Close brothers provided funding for the railway), this was refused by William Ogilvie, the territory's Commissioner. Whitehorse was booming. On May 23, 1905, a small fire in the barber shop of the Windsor Hotel got out of control when the fire engine ran out of water, spreading throughout the city and causing $300,000 in damage, though no lives were lost. Robert Service was working as a bank teller at the time and participated in suppressing the flame. The White Horse Restaurant and Inn was among the buildings destroyed, after its co-founder Frederick Trump, the grandfather of Donald Trump, had sold his shares and left the city. View of Whitehorse, in 1910. In 1920 the first planes landed in Whitehorse and the first air mail was sent in November 1927. Until 1942, rail, river, and air were the only way to get to Whitehorse, but in 1942 the US military decided an interior road would be safer to transfer troops and provisions between Alaska and the US mainland and began construction of the Alaska Highway. The entire 2,500 km (1,553 mi) project was accomplished between March and November 1942. The Canadian portion of the highway was only returned to Canadian sovereignty after the war. The Canol pipeline was also constructed to supply oil to the north with a refinery in Whitehorse. In 1950 the city was incorporated and by 1951, the population had doubled from its 1941 numbers. On April 1, 1953, the city was designated the capital of the Yukon Territory when the seat was moved from Dawson City after the construction of the Klondike Highway. On March 21, 1957, the name was officially changed from White Horse to Whitehorse. Whitehorse is located at kilometre 1,425 (Historic Mile 918) of the Alaska Highway and is framed by three nearby mountains: Grey Mountain to the east, Haeckel Hill to the northwest and Golden Horn Mountain to the south. The rapids which were the namesake of the city have disappeared under Miles Canyon and Schwatka Lake, formed by the construction of a hydroelectricity dam in 1958. 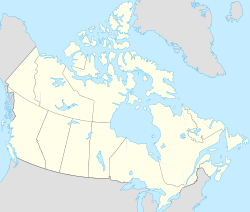 Whitehorse is currently the 64th largest city in Canada by area. The city limits present a near rectangular shape orientated in a NW-SE direction. Like most of Yukon, Whitehorse has a dry subarctic climate (Köppen climate classification Dfc). However, because of the city's location in the Whitehorse valley, the climate is milder than other comparable northern communities such as Yellowknife. With an average annual temperature of −0.1 °C (31.8 °F) Whitehorse is the warmest place in the Yukon. The temperature measurements for the city are taken at the airport. The Whitehorse Riverdale weather station situated at a lower elevation than the airport is even warmer at 0.2 °C (32.4 °F). At this latitude winter days are short and summer days have just over 19 hours of daylight. Whitehorse has an average daily high of 20.6 °C (69.1 °F) in July and average daily low of −19.2 °C (−2.6 °F) in January. The highest temperature ever recorded in Whitehorse was 35.6 °C (96 °F) on 14 June 1969. The coldest temperature ever recorded was −56.1 °C (−69 °F) on 21 January 1906. Whitehorse has little precipitation with an average annual snowfall of 145 cm (57.09 in) and 163 mm (6.4 in) of rainfall. According to Meteorological Service of Canada, Whitehorse has the distinction of being Canada's driest city, mainly because it lies in the rain shadow of the Coast Mountains. Whitehorse is in the Cordilleran climate region, the Complex Soils of Mountain Areas soil region, the Cordilleran vegetation region, and the Boreal Cordillera ecozone. In 2019, Whitehorse recorded their warmest March on record, having 9 days above 10°C and hit a maximum high of 13.8°C on March 20. Whitehorse Bylaw 426 (1975) restricts the operation of motor vehicles to designated roadways in certain "Protected Areas" to ensure maximum conservation of the environmental quality. Most are near the downtown core (downtown and Yukon river escarpments, Mt. Mac ski trails, Riverdale, Valleyview, Hillcrest, Granger, Porter Creek, and Mountainview) and one, Pineridge, is south of downtown. In 1999, the city approved the Area Development Scheme (ADS) which reallocated the area previously known as "Whitehorse Copper" to the following uses: Country Residential, Commercial, Service Industrial, and Heavy industrial. Recent demands for growth have reignited urban planning debates in Whitehorse. In 1970 the Metropolitan Whitehorse development plan included park and greenbelt areas that were to be preserved to ensure high quality of life even within city limits. 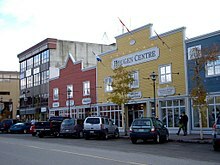 Due to Whitehorse's unique urban development objectives and varied topography, neighbourhoods are usually separated from each other by large geographical features. In addition to the city's downtown core on the Yukon River's west bank, two subdivisions sit at the same elevation as the Yukon River (640 m or 2,100 ft). Crossing the bridge to the east bank of the river leads to Riverdale, one of the city's oldest neighbourhoods. From Riverdale, the road climbing up Grey Mountain leads to Grey Mountain Cemetery and the local FM radio antenna. North of downtown is the Marwell industrial subdivision which used to be separated from the downtown by a large marshland but the first decade of 2000 saw huge commercial transformations and these two neighbourhoods are now contiguous. Prior to 1975, there were First Nation's people living along the Yukon River at the current sites of the S.S. Klondike riverboat, Rotary Peace Park, and the waterfront development area from the north end of 1st Avenue to the north end of the waterfront trolley line; these were expropriated and cleared. An aurora over a residential neighbourhood of Riverdale. Riverdale is located on the east bank of the Yukon River. The rest of Whitehorse is generally located above 690 m (2,260 ft). Immediately after climbing "Two Mile Hill", looking to the north are the old residential neighbourhoods of Takhini, Takhini North and Takhini East, where many homes actually are originally army barracks and military officers' residences. Yukon College, Yukon Arts Centre and Whitehorse Correctional Centre are situated in Takhini. Situated further north are Porter Creek and Crestview. West of downtown are Valleyview, Hillcrest (also largely constituted of old military lodgings) and the Erik Nielsen Whitehorse International Airport; and beyond the Canada Games Centre along Hamilton Boulevard are the neighbourhoods of McIntyre (designated to replace inferior lands and homes of the Kwanlin Dun First Nation ("The Village") previously located where Marwell adjoins a marshy area), then Ingram, Arkell, Logan, Granger, and rapidly expanding Copper Ridge. Whitehorse also has subdivisions designated "Country Residential" which are subject to different municipal bylaws and are located farther out from the downtown. They consist of the rural Whitehorse subdivisions of Hidden Valley and MacPherson at Whitehorse's northern limits; to the south: McCrae (also spelt MacRae), Wolf Creek, Wolf Creek North, Mary Lake, Cowley Creek, Spruce Hill, Pineridge and Fox Haven Estates. Also located at the south end of the city is the newly designated Mt. Sima Service Industrial Subdivision. Construction of Whistle Bend, Whitehorse's newest subdivision, began in 2010 on the "Lower Bench" east of the Porter Creek subdivision. Whitehorse's Yukon Arts Centre offers all varieties of shows and artists and includes an art gallery. Snow sculptures from the Whitehorse International Snow Sculpture Contest. The Frantic Follies Vaudeville Revue was a major tourist draw established in 1970, until it closed in 2017, citing falling tourist numbers. Recreating an 1890s style gold rush era vaudeville show, The Frantic Follies included barbershop quartet, sketches, marching band, banjo and saw orchestral numbers as well as kickline dancing girls. In 1973, the show was moved to the new Bonanza Room at the Whitehorse Travelodge. By 1975, its popularity had grown to such an extent that it became necessary to present two performances per night. In 1975 and again in 1977, the show embarked on cross-Canada tours, on which they performed everywhere from maximum security prisons to the Parliament Buildings in Ottawa. Twice the show travelled to Alert, the Canadian Forces Station five hundred miles from the North Pole. In 1976, the Company undertook to produce not only the Whitehorse show, but the entertainment in Dawson City's Palace Grand Theatre and Diamond Tooth Gertie's Gambling Casino. At the end of the 1980 season they left Dawson City. In January 1981, the show joined the "Snow Birds" for a season and moved to St. Petersburg, Florida, for a four-month run. The fall of 1990 saw the Frantic Follies taking to the road again as ambassadors for the Yukon in a whirlwind tour, performing in ten Canadian and American cities in a little over two weeks. The Frantic Follies was in part replaced by another vaudeville show by the same producer, the Klondike Follies, which hosted two events in the summer of 2017 and 20 shows in the summer of 2018. Plays are also performed at the Guild Hall in Porter Creek, and downtown Whitehorse's Wood Street Centre offers smaller local productions. Whitehorse's arts and entertainment schedule is non-stop throughout the year, not only with local events and celebrations but Whitehorse also plays host to several major festivals which attract artists from all over Canada and internationally, including the Sourdough Rendezvous' Ice Sculpture contest, the Frostbite Music Festival, the Yukon International Storytelling Festival, the Adäka Cultural Festival, the Out North Queer Film Festival and the Available Light Film Festival. The SS Klondike was a sternwheeler that ran freight between Whitehorse and Dawson City. It is now an attraction and National Historic Sites. Whitehorse's proximity to the wilderness and the northern range of the Rockies allows its residents to enjoy a very active lifestyle. The city has an extensive trail network within its limits, estimated at 850 km (528 mi) in 2007, including sections of the Trans Canada Trail. These trails are used for a variety of non-motorized and/or motorized activities. The Yukon River in and around Whitehorse provides many opportunities for kayaking and canoeing. Whitehorse hosts the beginning of Yukon Quest, a annual dog sled race from Whitehorse to Fairbanks, Alaska. The city is responsible for the maintenance of numerous sports and recreation fields including two dozen grass/sand/soil/ice sports surfaces, 3 ball diamonds, the Canada Games Centre Multiplex (pools, ice rinks, fieldhouse, fitness centre, walking/running track, physiotherapy), the Takhini Arena, and Mount McIntyre Recreation Centre. Private interests run Mount Sima (350 metres of downhill skiing in the winter and mountain biking in the summer), three golf courses, a bowling alley, and three gyms, including one with squash courts. The annual 1,000 mile Yukon Quest sled dog race between Whitehorse and Fairbanks, Alaska, is considered one of the toughest in the world. The race alternates its starting and finishing points each year. The city has hosted several large sporting events including the 2007 Canada Winter Games, for which a CA$45 million sport multiplex was built; the Canadian Junior Freestyle Championships in 2006, the Arctic Winter Games (2000, 1992, 1986, 1980, 1972, 2012 and up coming location for the 2020 games), the annual International Curling Bonspiel, and the Dustball International Slowpitch Tournament. Although there are no territorial junior league teams, the business community sponsors a number of local teams of volleyball, baseball, basketball, broomball, ice hockey, soccer and ultimate disk. High school teams are very active and partake in competitions with schools in neighbouring Alaska, and a few local athletes have flourished on the Canadian sports scene. Whitehorse is also home to the Whitehorse Glacier Bears swimming club. According to the 2016 Census, the population of Whitehorse is 25,085. The population density was 55.9 per km². The racial make up of Whitehorse is mostly made up of European (75.5%), but still has a significant amount of Aboriginals (16.5%); First Nations (13.5%) and Metis (2.2%). There is also a moderate visible minority population (7.9%); Southeast Asian (3.4%), Asian Canadian (1.8%) and South Asian (1.6%) were the three largest minority groups. The religious make up of Whitehorse is; Christian (45.3%) and non-religious (51.4%), the remaining 3.3% fall into another religion. Most of the residents are Canadian citizens (94.1%). As a federal territory, the Yukon is officially bilingual in English and French. In 2011, 84.3% of the residents of Whitehorse declared English as their only mother tongue, while 4.6% reported French as their only mother tongue, and 9.7% of the population reported a non-official language as their mother tongue. According to the 2011 census the most spoken non-official language in Whitehorse was German, followed by Tagalog, Spanish, Chinese and Dutch. Whitehorse has several schools as part of a Yukon Government operated public school system. Except for École Émilie-Tremblay Yukon does not have school boards, however each school has a council composed of three to seven elected positions for 2-year terms, consisting of (and elected by) citizens residing in the school's assigned area and parents of students attending the school. All teachers are employed directly by the Department of Education and there are no tuition fees to be paid to attend elementary and secondary institutions. The exception being Wood St. School, which offers specialized experiential programs for high school students in the sciences and arts. City Hall is home to the Whitehorse City Council. Whitehorse municipal elections occur every three years. Municipal services provided by the city of Whitehorse include: water and sewer systems, road maintenance, snow and ice control, non-recyclable waste and composting, as well as a mosquito control program. The Yukon Legislative Building is home to the Yukon Legislative Assembly. Whitehorse was represented by 9 of 18 MLAs in Yukon's Legislative Assembly, as per the 2002 map of Yukon electoral districts. In 2009 Yukon's electoral map was modified to give Whitehorse an extra seat, bringing its total up to 10 out of 19. The Legislative Assembly Building is located in downtown Whitehorse and elections usually take place every three to five years. The last general election was held in 2016. Whitehorse residents have four local political parties from which to choose: Yukon Liberal Party, Yukon New Democratic Party, Yukon Party, as well as the newly constituted Yukon Green Party. All of Yukon consists of a single federal electoral district and therefore there is only one MP and 65% of Yukon's voters live in Whitehorse. Residents of the Yukon have been voting federally since a byelection returned the first Yukon MP in January 1903 and, from 1984 onward, have had candidates from at least four federal political parties to choose from. In 2006, 2008 and 2011, the choices have been: Conservative, Green, Liberal, and NDP. Other parties that have contested the riding from 1984 onward include the Libertarian Party, the Rhinoceros Party, the three precursors of the Conservative Party (Reform Party, Canadian Alliance and Progressive Conservatives), the National Party (1993) and the Christian Heritage Party. Liberal Larry Bagnell is Yukon's MP, and was also Yukon's MP from 2000 to 2011, winning the 2006 election with 49% of the vote and voter turnout of 66%, on par with the total Canadian turnout of 65%, with Whitehorse districts turnout lower at 55%. All court matters are handled in Whitehorse at the Andrew Philipsen Law Building which also houses a law library. Yukon's Territorial Court (three judges) handles most adult criminal prosecutions under the criminal code and other federal statutes. The Supreme Court of Yukon has three resident judges and nine judges from NWT and Nunavut. The Court of Appeal, made up of justices from British Columbia, Yukon, NWT and Nunavut, sits in Whitehorse only one week of the year, so most appeals are heard in Vancouver, British Columbia. Aerial view of Whitehorse Cadet Summer Training Centre. The facility is used by the Canadian Cadet Organization. The Canadian Armed Forces is represented in Whitehorse by Canadian Forces Detachment Yukon located in downtown Whitehorse, Regional Cadet Support Unit (North) was at Boyle Barracks (until a re-organization in 2012 amalgamated the cadet support unit into Regional Cadet Support Unit (NW) based out of Winnipeg, Manitoba) and the Canadian Rangers of the Whitehorse Patrol of 1 Canadian Ranger Patrol Group. 2685 Yukon Regiment Army Cadet Corps and 551 Whitehorse Squadron, Royal Canadian Air Cadets of the Canadian Cadet Organizations also operate in Whitehorse. All units operate as part of Canadian Forces Joint Task Force (North). 440 Transport Squadron, and other units of the Royal Canadian Air Force, including the Snowbirds often operate and train out of Erik Nielsen Whitehorse International Airport, formerly RCAF Station Whitehorse. Boyle Barracks is located 20 km (12 mi) south of downtown Whitehorse. The facility houses Regional Cadet Support Unit (North), Whitehorse Cadet Summer Training Centre, service support elements of Joint Task Force (North), and is used by 1 Canadian Ranger Patrol Group, the Junior Canadian Rangers, and other units to conduct training. Boyle Barracks is located on the property of the unused Wolf Creek Juvenile Corrections Centre which is leased by the Department of National Defence from the Yukon Government. Whitehorse Cadet Summer Training Centre offers a variety of courses and activities that focus on general training, leadership, and expedition training up to the instructor level. Courses are two, three, and six weeks long and are offered throughout the summer. Personnel are drawn primarily from the territories, but many come from across Canada. The training centre also hosts members of the United Kingdom's Army Cadet Force and Combined Cadet Force. Broadcasting studio for CFWH-FM, which broadcasts programming from CBC Radio One. CFWH-FM is one of seven radio stations based in Whitehorse. Building for the Whitehorse Daily Star. The Daily Star is one of three newspapers operating in Whitehorse. Whitehorse is also served by CIY270, a Weatheradio Canada station broadcasting at 162.400 MHz on the weather band. Local cable provider NorthwesTel hosts three local television channels: Community Cable 9, an advertisement slide-show channel and a public service channel. CBC Television operated an affiliate in Whitehorse, CFWH-TV, from 1968 to 2001. Initially served using the Frontier Coverage Package until Anik satellite broadcasts became available early in 1973; this transmitter was shut down on July 31, 2001 due to budget cuts. Until 2009, there was a low-powered repeater of Edmonton's CITV-TV providing Global Television Network programming to the area..
Whitehorse's two major English language newspapers are the Whitehorse Daily Star (founded as a weekly in 1900, it now publishes five times per week since 1986) and the Yukon News (founded as a weekly in 1960 by Ken Shortt, published five days a week from 1967 to 1999, and currently prints twice weekly). Other local newspapers include What's Up Yukon (a local free music, arts, culture, events, weekly founded in 2005) and a French language newspaper L'Aurore boréale (founded in 1983). Whitehorse contracts out its police service to the Royal Canadian Mounted Police, with the main police station on 4th avenue in the city centre. Whitehorse's ambulance service are run by Yukon Government's Emergency Medical Services and is staffed by full-time Primary Care Paramedics (PCP) and Advanced Care Paramedics (ACP). Whitehorse's Search and Rescue (SAR) is ensured by a partnership between the RCMP, YG's Emergency Measures Organization (EMO) and volunteer SAR teams. Offices for the Royal Canadian Mounted Police M Division. Policing in Whitehorse is carried out by the RCMP. WHFD is equipped and trained to respond to Motor vehicle Accidents, high and low angle rescue, confined space, and static water ice rescue. Haz-mat, swift water and urban search and rescue are not under the departments current capabilities or can only be responded to at awareness levels. All medical emergencies are responded to by Yukon Government Emergency Medical Services. All aircraft emergencies are dealt with by the Eric Nielsen Whitehorse International Airport(ENWIA) ARFF fire department with mutual aid agreement activities from WHFD. Whitehorse Fire Department is professionally represented by the IAFF and the BCPFFA. Whitehorse Fire Department is the largest municipal fire department in the territory and the only professional one. Though they are 13% of the total population of firefighters in the territory, WHFD protects 82% of the population, and responds to 84% of fire calls within the Yukon. WHFD falls under the authority of the Yukon Fire Marshals Office (FMO) and reports directly to it. Fire and life safety inspection throughout the City of Whitehorse are conducted by the Whitehorse Fire Department duty crews as well as designated Fire Prevention Officers under the direction of Municipal Bylaw 2000-01 "Emergency Services Bylaw" with authority from the current edition of the National Fire Code of Canada. Wildland fire crews also operate in the summer to combat the forest fires across the territory. They will lend assistance to crews in B.C., Alberta, and the other territories as needed. Yukon Energy operates four conventional hydroelectric generating stations: Whitehorse Dam (40 MW), Aishihik Lake (37 MW), Mayo A (5 MW), and Mayo B (10 MW), which provide the bulk of generation for the Yukon Energy grid. An additional 39 MW of diesel generation is maintained for supplemental back-up. Additionally, Yukon Energy operates two wind turbines near Whitehorse, which are connected to the Whitehorse-Aishihik-Faro grid. The first turbine is a Bonus Energy 150 kW MARK III installed in 1993 that is no longer functional. The second turbine, a Vestas 660 kW V47 LT II was later installed in 2000 and operates only in the summer. These units need to be specially adapted to deal with icing and the northern environment. Whitehorse General Hospital is the only hospital in the city. The first "White Horse General Hospital" (WGH) was built in the downtown area in 1902 with a 10-bed capacity. During WWI beds increased to 30, 10 beds were added in 1943, then 20 beds in 1949, and an operating wing was added in 1951. In 1959 the hospital was rebuilt on the other bank of the Yukon River, across from its previous location, but decision making was still based in Ottawa (National Health and Welfare, Medical Services Branch). The downtown area has several private medical, dental, and optometry clinics. 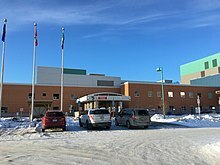 In 1990, the Yukon Hospital Corporation (YHC) was created in order to prepare the transfer of powers regarding the hospital from the Federal Government to the Yukon Territorial Government. In April 1993 management of WGH was officially transferred to the YHC following a collaboration with the Yukon government and Council of Yukon First Nations (CYFN, then CYI). Construction of the present building lasted from 1994 through 1997. Today Whitehorse General hospital counts 49 in-patient beds, 10 day-surgery beds, an ER department, OR suites and several medical imaging technologies. Whitehorse is served by the Erik Nielsen Whitehorse International Airport and has scheduled service to Vancouver, Kelowna, Victoria, Calgary, Edmonton, Yellowknife, Ottawa (via Yellowknife), Dawson City, Mayo, Old Crow, Inuvik, as well as Frankfurt, Germany during the summer months. The airport was developed as part of the Northwest Staging Route in 1941–42 and has two long paved runways. A wartime-era hangar served as terminal building from about 1960, and was replaced in December 1985 with a modern terminal. Air North, a scheduled passenger and cargo airline operating Boeing 737 jetliners and Hawker Siddeley 748 turboprops, is based in Whitehorse. In 1998 work was completed on a 340-metre runway extension and other improvements (concrete turn button, installation of storm and sanitary mains, lighting upgrades, tower access road and blast pad). Expansion of the terminal itself was completed in 2010. 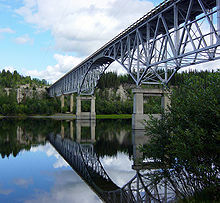 Bridge of the Alaska Highway crossing over the Teslin River at Johnsons Crossing. Surface access to Whitehorse is provided by a network of highways, including the international Alaska Highway connecting the Yukon with Alaska, British Columbia, and Alberta highway networks. Whitehorse has been described as "pearls on a string", with its residential, industrial, and service subdivisions located along the main thoroughfares that carry traffic within city limits, with large gaps of undeveloped (often hilly) land between them. The Alaska Highway is the primary roadway, with branch roads reaching additional subdivisions. One such branch road, signed as "Highway 1A" and following Two Mile Hill Road, 4th Avenue, 2nd Avenue, and Robert Service Way, is the main access to downtown, Riverdale, and the Marwell Industrial Area. Other branch roads (Range Road, Hamilton Boulevard, Mayo Road) access smaller residential areas and recreational facilities. The city road network is adequate, although it is congested during rush hours and discussions occasionally occur as to how it might better be managed, such as designating one-way streets. The Whitehorse Waterfront Trolley is a heritage streetcar service that operates from May to November. Whitehorse Transit provides bus service on weekdays from morning until early evening and Saturdays during business hours. There is a waterfront tram, known as the "trolley", which provides transport along a short rail section along the Yukon River; it is chiefly tourist-oriented and is not integrated into the municipal transit system. It runs from the Rotary Peace Park, located on the south end of the city centre, up to the north end of the city centre at Spook Creek Station. Whitehorse presently has no active railway service. The trolley system runs on a small portion of the tracks formerly belonging to White Pass and Yukon Route. The last scheduled service to Whitehorse from White Pass Railway occurred in October 1982. The White Pass Railway started scheduled service from Skagway, Alaska to Carcross, 72 km (45 mi) south of Whitehorse, in the spring of 2007, but this was disrupted by high lake water levels in August 2007. Speculation of a transcontinental rail link to Alaska includes one possible route option through Whitehorse; a report has recommended a hub at Carmacks, with a spur line to Whitehorse and on to the Inside Passage of Alaska. The Yukon River is essentially navigable from Whitehorse to the Bering Sea. At 640 m (2,100 ft) above sea level, the river at Whitehorse is the highest point on earth that can be reached by watercraft navigating from the sea. Currently, no passenger or freight services use the river at Whitehorse. Water disposal is mostly done by draining in a septic tank where the sewage is not that well developed. Waste is disposed mostly in areas requiring reclamation. This includes places like quarries, mined areas etc. Pierre Berton, an author and television host, born in Whitehorse. Ivan E. Coyote, a spoken word performer and writer, born in Whitehorse in 1969. Stephen Kozmeniuk, a musician who created the band Boy (Canadian band), music producer/composer who has worked with Madonna (entertainer), Kendrick Lamar, and others. Audrey McLaughlin, the first woman to lead a represented political party (NDP) in Canadian federal politics, who has resided in Whitehorse since 1979. Robert W. Service known as The Bard of the Yukon for his famous poems The Shooting of Dan McGrew, The Cremation of Sam McGee and many other depicting the Gold Rush and the special atmosphere of the Klondike. Whitehorse City Council which paid tribute to Robert Service with several monuments: Robert Service's Road, a Bust near where he lived, a Memorial Desk at the corner of 2nd Avenue and Main Street and various celebrations through the sister city relationship with the town of Lancieux. Jonas Smith of the band Field Day. Swedish/Canadian singer-songwriter Sarah MacDougall resides in Whitehorse. Notable athletes are Whitehorse born hockey players Bryon Baltimore, who made it to the Los Angeles Kings in 1974, and Peter Sturgeon who played for the Colorado Rockies in 1974, Whitehorse-born Olympic cyclist Zachary Bell, Whitehorse-raised Olympic weightlifter Jeane Lassen who won medals in several world competitions, Whitehorse born basketball players Aaron Olson, and 1984 Olympics centre for Team Canada Greg Wiltjer. Notable politicians include the first female mayor of Whitehorse, in 1975, Ione Christensen whose family had moved to Whitehorse in 1949, and Yukon's first senator, in 1975, Paul Lucier, who stayed in office until his death in 1999. Bob Smart's Dream, a 1906 poem by Robert Service that speculates about the Whitehorse of the future. ^ "About Whitehorse - Whitehorse, YT". www.city.whitehorse.yk.ca. ^ "Demonyms—From coast to coast to coast - Language articles - Language Portal of Canada". Archived from the original on 2014-08-30. Retrieved 2014-08-24. ^ a b Pinard, Jean-Paul (September 2007). "Wind Climate of the Whitehorse Area" (PDF). Arctic. 60 (3): 227–237. doi:10.14430/arctic215. ^ "Sunrise and sunset times in Whitehorse, June 2018". www.timeanddate.com. ^ a b "Whitehorse". The Canadian Encyclopedia. Retrieved 2011-03-25. ^ Gwenda Blair (2000). The Trumps: Three Generations That Built an Empire. Simon and Schuster. ISBN 978-0-7432-1079-9. ^ "The Whitehorse Interactive Traveller's Guide". pp. History–>Facts–>Whitehorse–>The Name "Whitehorse". Retrieved 2006-07-03. ^ "Whitehorse Keymap". Whitehorse Topography and Zoning. Retrieved 2011-03-26. ^ a b "Whitehorse Riverdale". Environment Canada. Retrieved 16 June 2016. ^ a b "Daily Data Report for January 1906". Environment Canada. 22 September 2015. Retrieved 16 June 2016. ^ Staff, DH Toronto (2019-04-04). "Whitehorse was warmer than Toronto for the ENTIRE month of March". Daily Hive. Retrieved 2019-04-08. ^ "Whitehorse". Environment Canada. 22 September 2015. Retrieved 16 June 2016. ^ "Daily Data Report for January 2009". Environment Canada. 22 September 2015. Retrieved 16 June 2016. ^ "Daily Data Report for July 2009". Environment Canada. 22 September 2015. Retrieved 16 June 2016. ^ "Daily Data Report for March 2016". Environment Canada. 22 September 2015. Retrieved 16 June 2016. ^ "BYLAW 426" (PDF). OFFICE CONSOLIDATION To Bylaw 94-02 Passed January 24, 1994. City of Whithorse. Retrieved 2011-03-27. ^ "Protected Areas within City Limits". City of Whitehorse. Retrieved 2011-03-27. ^ "A downhill slide". Yukon News. 9 April 2010. Retrieved 2011-03-26. ^ "CBC AM transmitter gets three years' grace". Whitehorse Star. 14 July 2009. Retrieved 2011-03-26. ^ "Camp Takhini". Down North, A Dependent's Notes of Interest. © Jean Watts 2002. Retrieved 2011-03-26. ^ "Animal FAQ". Bylaw Services. City of Whitehorse. Retrieved 2011-03-26. ^ "try Residential – Whitehorse". Socio-Economic Web Portal. © Yukon Bureau of Statistics. Retrieved 2011-03-26. ^ "Whitehorse Copper History". Planning and Development. City of Whitehorse. Retrieved 2011-03-26. ^ "Whistle Bend". Development and Planning, Lot Sales. City of Whitehorse. Retrieved 2011-03-26. ^ "Curtain closes on Yukon's Frantic Follies entertainment act | CBC News". CBC. Retrieved 2018-11-13. ^ "Whitehorse Daily Star: Curtain falls on performer's local career". Whitehorse Daily Star. Retrieved 2018-11-13. ^ "Yukon Sourdough Rendezvous". Retrieved 2011-03-26. ^ "Frostbite Music Festival". Retrieved 2011-03-26. ^ "Out North Queer Film Festival celebrates its seventh year". Yukon News, October 11, 2018. ^ "Available Light Film Festival". Retrieved 2011-03-26. ^ "City of Whitehorse 2007 Trail Plan". Whitehorse.ca. Retrieved 2011-03-02. ^ "Mt. McIntyre Recreation Centre". Retrieved 2011-03-26. ^ "Mount Sima". Retrieved 2011-03-26. ^ "Mad Trapper Alleys". Retrieved 2011-03-26. ^ "Canada Games – Winter 2007". 2007canadagames.ca. Retrieved 2011-03-02. ^ "Arctic Winter Games 2008". ^ "Annual International Bonspiel". Retrieved 2011-03-26. ^ "Dustball information". Retrieved 2011-03-26. ^ "Whitehorse Glacier Bears". Retrieved 2019-01-18. ^ Census Profile, 2016. 2.statcan.gc.ca. Retrieved on 2018-09-24. ^ Statistics Canada. "Focus on Geography Series, 2011 Census". Retrieved 16 February 2015. ^ "Yukon Education Student Network – Schools". Yesnet.yk.ca. 2011-02-01. Retrieved 2011-03-02. ^ "School Councils". Education. © Government of Yukon 2011. Retrieved 2011-03-29. ^ "Christ the King Elementary School". yesnet.yk.ca. Retrieved 25 September 2015. ^ "Elijah Smith Elementary School". yesnet.yk.ca. Retrieved 25 September 2015. ^ "Golden Horn Elementary School". yesnet.yk.ca. Retrieved 25 September 2015. ^ "Untitled Document". yesnet.yk.ca. Retrieved 25 September 2015. ^ "Holy Family Elementary School". yesnet.yk.ca. Retrieved 25 September 2015. ^ "Jack Hulland Elementary School". yesnet.yk.ca. Retrieved 25 September 2015. ^ "Selkirk Elementary School". yesnet.yk.ca. Retrieved 25 September 2015. ^ "Takhini Elementary School". yesnet.yk.ca. Retrieved 25 September 2015. ^ "Vanier Catholic Secondary School – Home". Vanier Catholic Secondary School. Retrieved 25 September 2015. ^ "F.H. Collins Secondary School". ^ "Porter Creek Secondary School". yesnet.yk.ca. Retrieved 25 September 2015. ^ "École Émilie-Tremblay". csfy.ca. Retrieved 25 September 2015. ^ "Whitehorse Individual Learning Centre". yesnet.yk.ca. Retrieved 25 September 2015. ^ "Public Works". City of Whitehorse. Retrieved 2011-03-27. ^ "View map of Yukon Electoral Districts (2002)". Maps. Elections Yukon. Retrieved 2011-03-27. ^ "Election Call". Yukon Elections. Elections Yukon. Retrieved 2011-03-27. ^ "Some northerners stymied by new voter ID rules on election day". CBC news online. 14 October 2008. Retrieved 2011-03-27. ^ "Voter turnout increases by 5 per cent, up to 65%". CTV News. 24 January 2006. Retrieved 2011-03-27. ^ "39th General Election – Poll-by-Poll Results – Raw Data". Elections Canada. Retrieved 2011-03-27. ^ "Yukon Courts". Yukon Department of Justice. Retrieved 2011-03-27. ^ "Whitehorse Community Cable 9 Weekly Schedule". NorthwesTel. Retrieved 2011-03-25. ^ "Community Television". NorthwesTel. Retrieved 2011-03-25. ^ "April 4". radio-canada.ca. Retrieved 25 September 2015. ^ (CRTC), Government of Canada, Canadian Radio-television and Telecommunications Commission. "ARCHIVED - Revocation of licences for the rebroadcasting stations CBIT Sydney and CBKST Saskatoon and licence amendment to remove analog transmitters for 23 English- and French-language television stations". www.crtc.gc.ca. ^ "À propos". auroreboreale.ca. Retrieved 2019-01-19. ^ "Emergency Medical Services". YG Department of Community Services. © Government of Yukon 2011. Retrieved 2011-03-26. ^ "Search and Rescue". YG – Department of Community Services. © Government of Yukon 2011. Retrieved 2011-03-26. ^ "Fire Department". City Departments. City of Whitehorse. Retrieved 2011-03-26. ^ "Fire Department Background" (PDF). APPLICANT INFORMATION PACKAGE. City of Whitehorse. Retrieved 2011-03-26. ^ "Whitehorse, YT : Home". www.whitehorse.ca. Retrieved 2016-06-08. ^ "Welcome to the IAFF Website". www.iaff.org. Retrieved 2016-06-08. ^ "Our Facilities". Yukon Energy. Retrieved 2012-12-31. ^ Yukon Energy. Yukonenergy.ca. Retrieved on 2013-09-27. ^ "History". About Us. Yukon Hospital Corporation. Retrieved 2011-03-26. 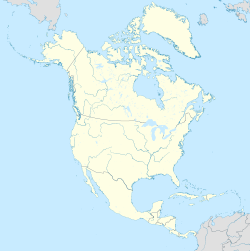 ^ "Whitehorse International Airport Runway Extension". YES Group. Retrieved 2011-03-26. ^ "Lancieux, France Sister City Program". City of Whitehorse. Retrieved 2014-10-27. ^ "Ushiku, Japan Sister City Program". City of Whitehorse. Retrieved 2014-10-27. ^ "Ushiku mayor bids thanks, farewell to Whitehorse". Whitehorse Daily Star. 9 August 2005. Retrieved 2011-03-19. ^ "Item 12660" (PDF). Shire of Campaspe – Minutes. 16 September 2008. Retrieved 2011-03-19. ^ "Robert W. Service (1874–1958) Yukon Bard & Adventurer: Robert Service's Bust in Whitehorse". robertwservice.blogspot.fr. Retrieved 25 September 2015. ^ "Robert W. Service (1874–1958) Yukon Bard & Adventurer: Jumelage Whitehorse-Lancieux, September 27th 2013". robertwservice.blogspot.fr. Retrieved 25 September 2015. ^ Belik, Vivian (2009-08-21). "A one-man band's long journey". Yukon-news.com. Retrieved 2011-03-02. ^ "Sports-Reference". Sports-Reference. Retrieved 2011-03-02. ^ "Stephanie Dixon honoured with appointment to Order of Canada - Yukon News". 5 January 2018. 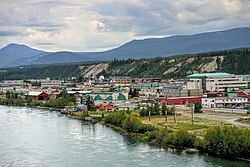 Wikimedia Commons has media related to Whitehorse, Yukon.